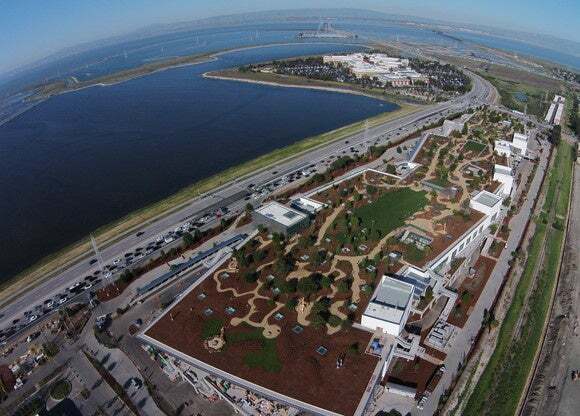 When Facebook expanded into a new campus in late March, the company released a stunning aerial photo of the site captured from a drone. In taking the picture, Facebook almost certainly broke two FAA regulations governing drone use. The social network isn’t alone in its carelessness. Drone use has taken off quickly among both businesses and individuals, and many people—even sophisticated technology companies—apparently are not fully aware of the rules. The Facebook image was captured by a DJI drone at what appears to be several hundred feet above a corner of its new campus in Menlo Park, California. The building sits about 2 miles from Palo Alto Airport—easily within the 5-mile zone in which drone operators must obtain permission from an airport before conducting a flight. Palo Alto Airport’s air traffic control tower said it received no such request or notification of the flight. Even if it had, current FAA regulations also prohibit any commercial use of drones unless a company has obtained a waiver, and Facebook isn’t among the handful of companies that have. Asked about the image, Facebook said “the photos were taken for non-commercial use on our property.” But the FAA is clear that only flights conducted for “purely hobby” purposes are permitted without a waiver. Whether the flight is over public or private land is irrelevant. “There’s a lot of confusion over the rules,” said Patrick Egan, who runs sUAS News, a website specializing in drone news. There’s confusion around the use of drones to shoot video as well. The FAA recently said it won’t go after people who post drone flights on YouTube and collect advertising money from the site. Some had worried that would constitute commercial use. But conversely, flights conducted by businesses aren’t non-commercial just because no money changes hands. A lawyer specializing in drone rules said she advises clients to be extremely conservative about how they conduct flights while the FAA is considering new, longer-term rules. Perhaps as a result of the confusion, the list of illicit drone flights is getting longer by the week. In December, fans attending a San Francisco Giants NFL game flew a drone over Levi’s Stadium in nearby Santa Clara. The airspace above most major sporting events is off limits to drones. In January, a drunk federal worker flew and crashed a drone into the White House lawn. The entire airspace of Washington, D.C., is federally restricted. In March, a drone was spotted flying at about 1,500 feet above a TV news helicopter in Seattle, and well above the allowed 400 feet maximum altitude. For every flight that is noticed, it’s likely that many take place that don’t attract attention. Indeed, Bedwell Bayfront Park near Facebook’s campus is a popular weekend location for Silicon Valley drone enthusiasts despite its proximity to both Palo Alto and San Carlos airports. Some YouTube videos show drones flying from the park to over 3,000 feet—much higher than permitted and close to the altitude of jets on approach paths to nearby San Francisco International Airport. The FAA has proposed a new set of regulations that would allow companies to fly drones, but they are not expected to be enacted until late 2016 or early 2017. A public comment period on the proposal ends on Friday.